It’s easy to understand the appeal of handmade jewelry. Aside from it being a more personalized approach to crafting fine jewelry, each piece will always be a little different from the rest. After all, handmade jewels forgo the uniformity of machine-made and instead celebrate individuality. Every jewel at the hands of a master jeweler will benefit from a unique touch, no matter how discrete the differences. This is especially true of Diamonds in Glass® jewelry, which combines the preciousness of fine diamonds and gold with handmade glassblowing techniques. Find out how familiar glass is intricately hand shaped and combined with luxurious diamonds to create some of the most unique fine jewelry to date. The process of glassblowing takes molten glass and inflates it into bubbles by blowing air into it via a blowpipe. The glass is then shaped into a myriad of forms only limited by the glassblower’s imagination. The possibilities are endless. As anyone who has seen this technique live in action can tell you, it’s a truly mesmerizing experience to watch glass objects being hand-shaped by a glassblower right before your eyes. Diamonds in Glass® takes the art of glassblowing even further by adding diamonds to the handmade glass forms. Using talented artisans, state-of-the-art equipment, and a new diamond-setting technique, Diamonds in Glass® successfully adorns the hand blown glass with diamonds for unique and unforgettable treasures. 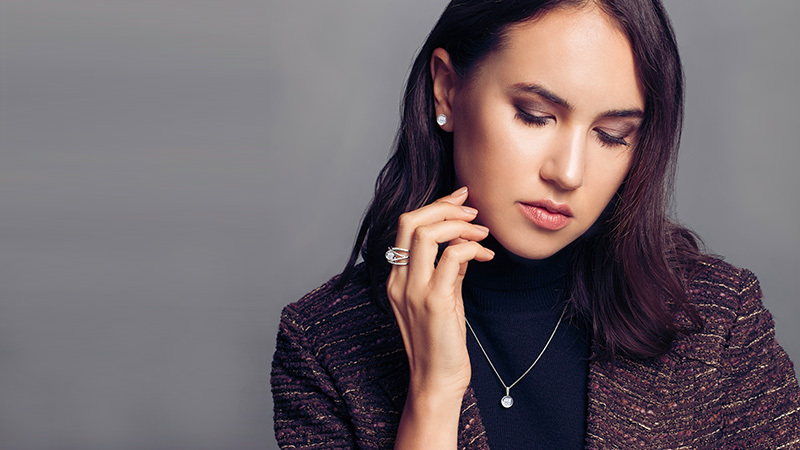 Thanks to designer Natascha Schenk’s vision, Diamonds in Glass® offers incredibly unique fine jewelry pieces. From earrings to pendants to rings to cufflinks, Diamonds in Glass® jewelry pieces always feature a signature diamond set into a hand blown glass sphere. These glass balls with floating diamonds are then joined by gold and fashioned into a range of fine jewelry. The unique diamond setting allows the precious gem to show off its beauty in its entirety—from top to tip—rather than just the upper portion typically seen in more traditional jewelry. Additionally, glass has the added benefit of magnification. As a result, the floating diamonds enveloped in the glass orbs exude much more brilliance than its natural size allows. Cherished by civilizations throughout history, both glassblowing and jewelry making are ancient art forms that survive and thrive today. Marrying them together is a completely contemporary and innovative concept. A nod to tradition with an eye for modern design is the Diamonds in Glass® unique point of view. For original and inventive diamond jewelry pieces, Diamonds in Glass® unquestionably offers techniques and designs that cannot be found anywhere else. Handmade fine jewelry creatively reimagined to surprise and delight.